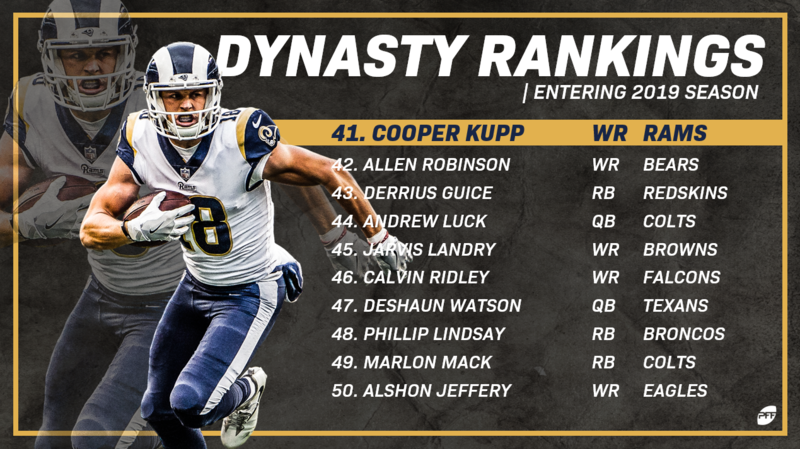 It’s a great time of the year for some dynasty fantasy football rankings. Startup drafts are in full swing and moves are being made in established dynasty leagues. These rankings will help you out on both fronts. We’re assuming PPR scoring and age is a major factor in establishing rankings for dynasty leagues. 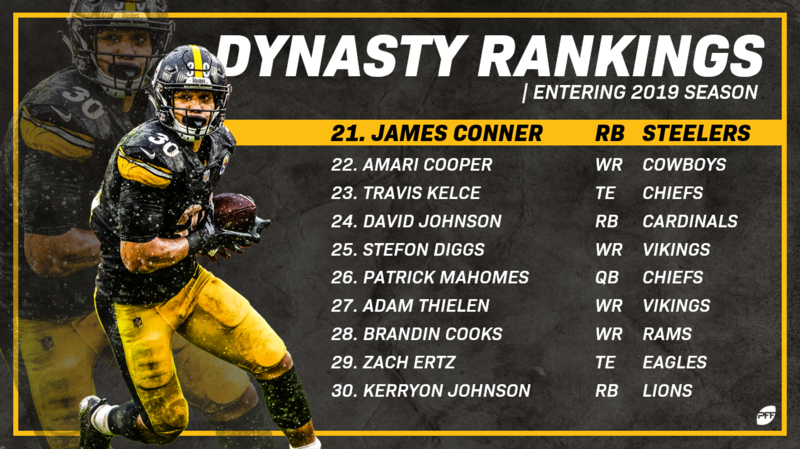 You can also check out the full dynasty fantasy football rankings from the PFF Fantasy staff. 1. Saquon Barkley, RB — Barkley is coming off a massive rookie campaign and figures to be the focal point of the Giants’ offense with Odell Beckham Jr. now in Cleveland. 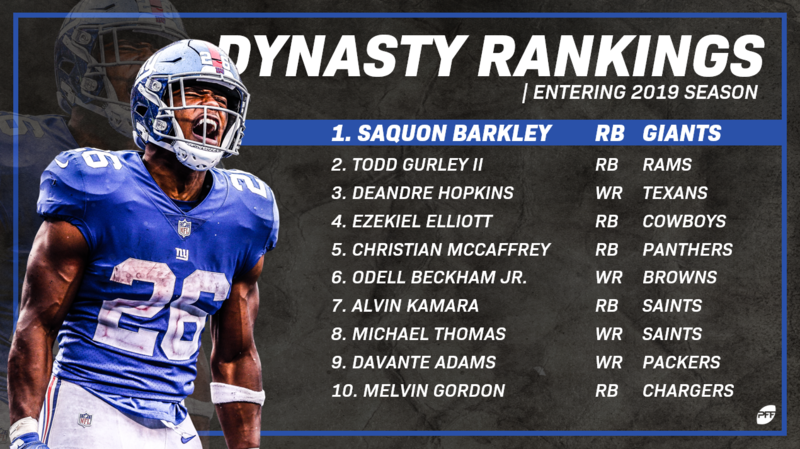 Given the scarcity at running back, Barkley is the clear top overall dynasty option. 2. Todd Gurley, RB — The knee issue is somewhat concerning, but we’re still operating with limited information on that front. What we do know is for a better part of the last two years, Gurley has been the most productive fantasy running back in the league. 3. DeAndre Hopkins, WR — He’s coming off a massive 115-catch season where he notched the third double-digit touchdown total of his career. Better yet, he’s entering just his age-27 season. 4. Ezekiel Elliott, RB — The Cowboys back took a massive step forward in the passing game with 77 catches on 95 targets last season. That three-down usage plus his youth make Elliott a complete dynasty package. 5. Christian McCaffrey, RB — While McCaffrey may not run the ball as much as the more traditional running backs in the league, he did manage to top 200 carries last season. He also notched 107 catches, which was eighth-most in the league. 6. Odell Beckham Jr., WR — Now in Cleveland, Beckham’s long-term arrow is pointing up with Baker Mayfield throwing him the ball. Like Hopkins, Beckham has youth on his side, as he’ll turn 27 in November. 7. Alvin Kamara, RB — Mark Ingram out of the mix solidifies Kamara as the Saints’ clear feature back. He’s one of the league’s best pass-catching backs and is no slouch between the tackles. 8. Michael Thomas, WR — Only three players in NFL history have recorded more receptions in a single season than Thomas’ 125 from last year. Better yet, he’ll be just 26 this year. 9. Davante Adams, WR — With 35 touchdowns over the last three seasons, Adams is second only to Antonio Brown in that category. He’s just 26 years old and is locked in as Aaron Rodgers’ top receiving option. 10. Melvin Gordon, RB — While he hasn’t been the most efficient back in his pro career with just 4.0 yards per carry, Gordon has averaged a shade under 270 touches per season in the NFL. That said, his dynasty window is starting to close with him entering his age-26 season. 11. JuJu Smith-Schuster, WR — Everything is trending in the right direction for Smith-Schuster. He’s coming off a massing 111-catch season, he’s now locked in as the Steelers’ top wideout, and he’ll be just 22 years old when the season begins. 12. Tyreek Hill, WR — The league’s most dynamic receiving option currently has a somewhat murky short-term outlook based on his being investigated for off-field issues, but on the field he’s one of the top dynasty wideouts. 13. Mike Evans, WR — The Bucs wideout has somewhat quietly topped 1,000 receiving yards in all five of his professional seasons and set a career best last year with 1,524. He’s also just 26 years when the season starts. 14. Joe Mixon, RB — Mixon took a big step forward last year with 1,168 yards and eight scores on the ground to go along with 43 catches. His stock is trending up in what will likely be a new-look Bengals offense. 15. Julio Jones, WR — He’s been one of fantasy’s best fantasy wideouts for a better part of the last decade, but Jones is now on the wrong side of 30 and is no longer a top-10 dynasty option. 16. Dalvin Cook, RB — With Latavius Murray out of the picture in Minnesota, Cook figures to see an uptick in usage. If he manages to stay healthy, he’s poised to be one of the better dynasty running backs over the next three seasons. 17. Antonio Brown, WR — Like Julio Jones, Brown’s dynasty arrow is pointing down. While he’ll still be a redraft option in Oakland, it’s tough to get behind drafting a 31-year-old wideout in a dynasty startup. 18. Keenan Allen, WR — He’s managed to play all 16 games in each of the last two seasons and has logged a combined 199 catches over that span. While Allen doesn’t have the ceiling of some of the receivers ranked above, his high floor is ideal for fantasy purposes. 19. Le’Veon Bell, RB — Entering his age-27 season, Bell has lost his luster as a dynasty option. He’ll still have short-term value, but his age makes him a risky dynasty investment. 20. Nick Chubb, RB — Having to share the backfield with Kareem Hunt is far from optimal, but Chubb is young (23) and coming off a breakout rookie campaign where he rushed for almost 1,000 yards despite not starting until Week 7. 21. James Conner, RB — One of last year’s biggest fantasy surprises, Conner inherited the uber-valuable Steelers running back spot that made Le’Veon Bell one of the top dynasty options over the last half-decade. 22. Amari Cooper, WR — Still just 25 years old when the season starts, Cooper’s fantasy outlook is much brighter in Dallas than it was in Oakland. He caught 53 balls for 725 yards and six scores in nine games with the Cowboys last season. 23. Travis Kelce, TE — Having a good tight end is a huge advantage in fantasy football, and there’s no one better at the position than Kelce. The only thing keeping him out of the top-20 is his age, as he’ll turn 30 in October. That said, age isn’t as big of a factor at tight end as it is at running back and wideout. 24. David Johnson, RB — Speaking of age, don’t overlook the fact that Johnson turned 27 in December. That’s sneaky old for the position, and his dynasty stock is trending down. 25. Stefon Diggs, WR — The dynamic Vikings receiver is coming off his first triple-digit catch season as a pro and enters 2019 at just 25 years old. 26. Patrick Mahomes, QB — Some may have Mahomes higher, and there’s a fair argument to be made for him inside the top-25. But there’s still a lot of value to be had at quarterback in dynasty startups, and that pushes him down just slightly in these rankings. 27. Adam Thielen, WR — Yes, Thielen has been the Vikings top target over the last two seasons, but he’s less appealing than Diggs in dynasty because he’s more than three years older. 28. Brandin Cooks, WR — Cooks is entering his sixth NFL season and will be just 26 years old. He’s topped 1,000 receiving yards in each of the last four seasons and continues to offer major upside in the explosive Rams’ offense. 29. Zach Ertz, TE — He may not be as dynamic as Kelce, but Ertz’s heavy workload is ideal for fantasy purposes. He’s topped 100 targets in each of the last four seasons and set a career-best 116 catches in 2018. 30. Kerryon Johnson, RB — The young Detroit running back showed flashes of fantasy upside in 2018.He’ll be just 22 years old when the season starts and is a good bet to take a step forward as the Lions lead back. 37. Corey Davis, WR — There’s a lot to like about Davis from a dynasty standpoint. He’s young and is locked in as the clear top option in Tennessee. But the Titans will need to start passing the ball more for Davis’ dynasty stock to rise. 43. Derrius Guice, RB — We don’t know what we’re going to get or when we’re going to get it from Guice, but he’s a lottery ticket worth paying for in the fourth round of a dynasty startup. 51. Chris Godwin, WR — With DeSean Jackson and Adam Humphries out of the way, Godwin’s fantasy arrow is pointing up. 61. O.J. Howard, TE — It takes time for tight ends to develop in the NFL, but Howard has already shown flashes of elite fantasy potential. He’s a good bet to be one of the top fantasy tight ends over the next half decade. 67. Carson Wentz, QB — Injuries have plagued the Eagles signal-caller over his first three seasons in the NFL, but Wentz is just 26 years old and has the potential to be a strong fantasy option for a decade or longer. 73. Doug Baldwin, WR — Baldwin is on the wrong side of 30 with injuries starting to mount up. His dynasty stock is trending rapidly downward. 84. Mark Ingram, RB — Don’t overlook the fact that Ingram is entering his age-29 season. Yes, he’s in a position to be effective in 2019, but his long-term dynasty outlook isn’t favorable. 100. Rob Gronkowski, TE — Once the top dynasty tight end and a top-20 overall option, Gronk is slowly spiraling down the rankings. He’s a risky pick in a dynasty startup.